After the Ginkgo was brought to North America about two hundred years ago, Henry Clay is believed to be the first to re-introduce the species to central Kentucky. More about this event in "The Ginkgo in America" by Peter del Tredici, Arnoldia, Harvard University. Photo: The largest Ginkgo tree in Ashland was planted after Henry Clay’s lifetime, around the Civil War. It has taken nearly 150 years for it to reach its current size. 35th Annual Hachioji Ichou Festa November 15-16, 2014. 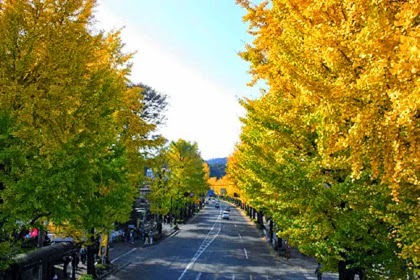 "The Koshu Highway runs through Hachioji, lined for four kilometers with around 770 ginkgo trees from the Oiwake area to Takao Station. The trees decorate the area all year with different colors and looks. In autumn in particular, the ginkgo leaves turn bright gold, creating a beautiful scene for strolling amid the crisp air. In the c. 80 years since the ginkgo trees were planted, Hachioji has changed greatly. In just the last 30 years, some 23 universities and many housing developments have sprung up. The city's industries have evolved as well, and with them the lifestyle of its residents. Ichou Festa was established as a venue where those living along the Koshu Highway, longtime and newer residents of Hachioji at large, students, and all people young and old can interact and together enjoy the nature and culture of Hachioji. The festival aims to energize and broaden the city's development while enabling residents to participate in an array of activities and performances. Unlike many festivals, Ichou Festa was created and is run by the residents themselves, and offers a unique experience for all visitors and participants." 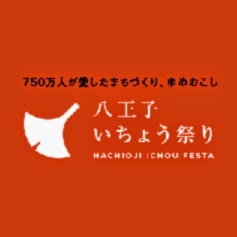 More info/photos on website of Hachioji Ichou Festa and TimeOut. 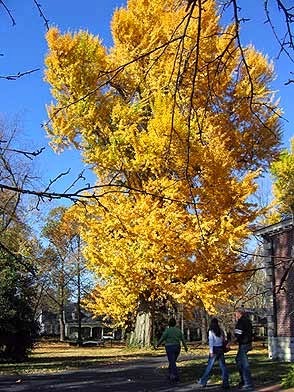 Great video of 400-year-old Ginkgo tree. Height 29.2 m, girth 5.43 m.
Location Nagaretani Hachiman Shrine, Kawachinagano, Osaka prefecture, Japan. Video on YouTube by shirokumataiketsu. 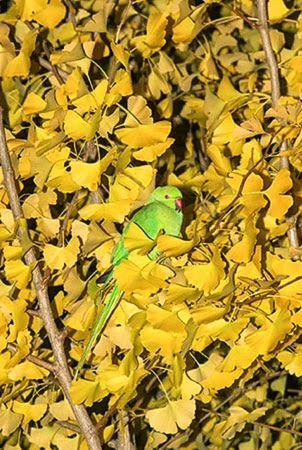 Lovely photo of a parakeet in a Ginkgo tree in Tokyo, Japan. Photo by Japanese photographer Yoshinori Mizutani: ""When I first saw them I was afraid – I thought I was going to be attacked, like in Hitchcock's The Birds." The parrots were taken to Tokyo as pets in the 70s from tropical regions such as India and Sri Lanka, and the city's trees are now inhabited by feral parakeets. Mizutani photographed them mainly at night, when they would roost in local Ginkgo trees. Mizutani says, "I wanted people to know another side of Tokyo by photographing a surprising scene beautifully.""